Today was the first day of SSC Combined Higher Secondary Level Exam (CHSL) Tier I Exam. This exam is scheduled to take place from 4th to 26th March 2018 and is being conducted in 3 shifts (10 AM to 11 AM, 1.30 to 2.30 PM & 4.30 to 5.30 PM) each day. 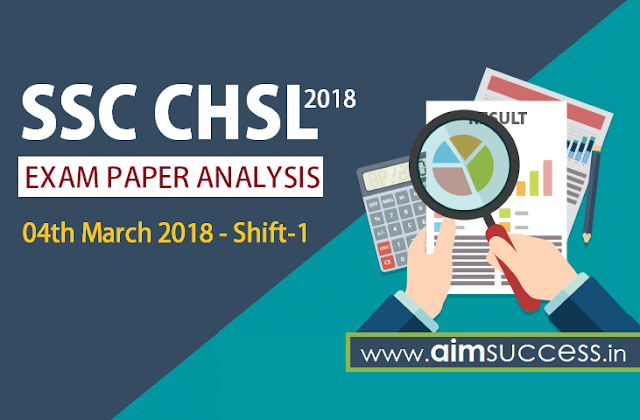 As the SSC CHSL Exam for 1st shift is over now, have a look at the SSC CHSL Analysis 4th March 2018 for Tier I Exam. Know about the Good Attempts and section-wise & overall Difficulty Level of the exam to stratagize your exam preparation for coming SSC CHSL Exam. In SSC CHSL Tier-1 Exam 2018, Quantitative Aptitude was of easy-Moderate Level. Most of the questions were based directly on Formulas and some were calculative. Name the longest border with China? What is the allocation of total budget? One question from i3 Processor.